The hike to Margy’s will start at 8:30 a.m. on Friday from the Lenado trailhead, half an hour from Woody Creek (an hour from Aspen). We will return to the Lenado trailhead mid-afternoon on Sunday. Be ready for a weekend of plenty of outdoor activities! The starting elevation is 8,640 feet. 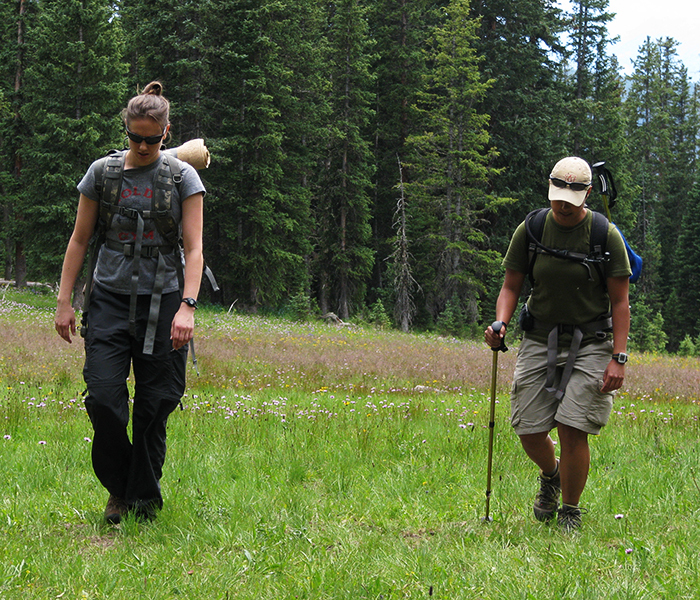 We will climb to 11,300 feet over 6.5 miles of moderate trails. The distance takes about 5 hours at a casual pace, with rest stops and a lunch/discussion at Sawmill Park (5.5 miles). We will travel light, but daypacks should contain rain gear, warm clothing, water, snacks, lunch for Day One and readings. (Please carry your readings in a waterproof cover!) Overnight gear and supplies for the hut will be shuttled in by vehicle from the Lenado trailhead, so pack a duffel for the hut. For those who choose not to hike the distance, a ride to Margy’s can be arranged with the transport vehicle. Those who ride will meet the group at Sawmill Park for lunch. While there are stream crossings over logs, and the trail is rough with rocks and roots, risks are minimal. The hut kitchen is equipped with a wood-burning cook stove, propane range top, pots, pans, and table service, but no running water. All water will be hauled in by vehicle, which means we will economize. The hut includes a deck, living room, wood-burning heat and cook stoves, several separate bedrooms, and a communal bunk room. Margy’s Hut accommodates 16 guests. Tent camping beyond the hut boundary is available for those who prefer a removed, wooded setting. The outhouse is quaint and rustic, and solar showers may be available. Electric lighting is provided by photo-voltaic solar panels and a battery storage system. 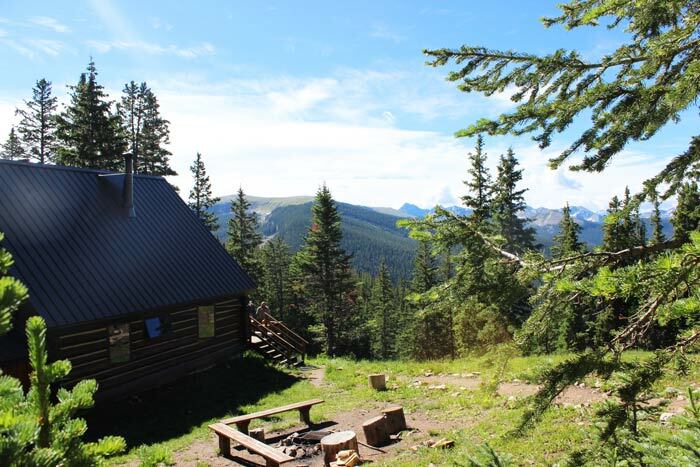 Meals, beverages, appetizers and other necessities will be prepared at the hut. A campfire circle makes a perfect venue for stargazing. I came to Huts For Vets expecting to be available for wounded souls. I didn’t expect to learn how talented, dedicated, and just plain great vets are. Yeah, they suffer problems, but their courage and motivation to continue to give to others has been a revelation. Reach out. Get to know a vet and you’ll find a quality person who has more to offer than you could ever imagine. Thank you, guys! Thank God for all the wonders He has created and Huts For Vets for providing a conduit to return me to these wonders. Semper Fi! This has been a great program that is a catalyst to healing and becoming whole again. There is no better place to start this process than with nature. Thank you! Experienced great time with fellow vets. Learned that life is about living the moment, with no fear of retribution. Fear only controls emotion which creates hostility and anger. Being outdoors has broken me into pieces by realizing pain. Thoughts that were buried I brought to the surface. On the walks these thoughts consumed my every breath. Memories are always going to remind me of where I was before deployment, during deployment, and currently. I am not a horrible person. Only to get better. This trip was far more amazing than I ever could have imagined. The mountains were absolutely amazing and serene, and make you not want to go home. The leaders and exercises really made you think, and it helped a lot to prioritize life, which can be very difficult to do with PTSD. I highly recommend this trip to any veteran who has returned home physically, but is still trying to find their way back mentally. This was an amazing experience. The connection I possessed with this band of brothers, military or not, is sure to have a positive impact on myself and those in my presence. I have found the tools I need to make it happen. Now, all that is left is Action! God speed to Huts For Vets and all of its successors. I am a person that spends time outdoors, but my time here has been different – the perfect “reset.” I will take the tools I have gained and better myself. Being in this wilderness has helped me understand the value, quality and significance of these wild places. “The further man’s feet are from the earth, the less respect he has for living, growing things.” The men here have taught me that I must improve myself in order to enjoy the freedoms that we all fought for. The Huts For Vets staff is an amazing group of guys with an exceptional program that can give the combat veteran tools to be able to cope with transitions and the issues associated with PTSD, TBI, etc. This program exceeded all my expectations, and the talk, the laughter, music and general BS were truly a gift and proved that camaraderie and brotherhood cross the lines of military branch, unit, and years. Thanks for everything! Thank you to everybody associated with Huts For Vets. Not only have I been allowed to see some of God’s most beautiful landscapes throughout the Hunter-Frying Pan Wilderness Area, but I have also been able to connect with fellow vets with similar situations and reflect on where I am now and where I want to be. This trip exceeded all expectations in every way. Wow! Words cannot express the impact this experience has had on my heart and soul! Wilderness therapy for combat vets is an incredible and innovative concept. What a journey! I have come further with braving my post-traumatic experiences in the last three days than I have in two years dealing with the VA. I pray that my fellow brothers and sisters in arms find their way to experience the enlightenment that Huts For Vets has provided. God bless!